.CSV format stores tabular data in plain text. This file type has a pretty simple structure and can be read by many programs. Nowadays it becomes very popular and is used by different applications to exchange data. In e-commerce CSV is also wide used to import data to online stores. The great majority of internet merchants use CSV files, that’s why the process of import should be fast and easy. 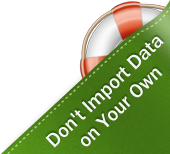 File2Cart is an automated data import service that was specially designed to make data import simpler and more rapid. Now you can move all entities you need via CSV file to your shopping cart, including such popular platforms as Magento, PrestaShop, VirtueMart, etc. recommended field delimiters: ",", ";" or "|"
.XML is a markup language that is both human- and machine-readable. It contains different rules for proper encoding of the documents. It was designed to ease and enhance usability over the Net. XML is used to present not only documents but also data structure. That’s why XML is widely used in e-commerce these days to contain info about products, customers, prices, etc. Providing simple, safe and swift import of your data, File2Cart supports over 30 shopping carts, including Magento, PrestaShop, VirtueMart and many other. Move products, images, categories and more from your XML datafile to your store for reasonable price. XLS / XLSX are file extensions for a spreadsheet file format created by MicrosoftTM for use with MicrosoftTM Excel. XLS file format is known as the Binary Interchange File Format (BIFF). Data inside all Office Document files are stored in series of fixed-size streams. The location of each fixed-size stream is described by several sector allocation tables. These streams contain meta-data information about the document, such as the author name, subject, and individual sheet names. XLSX file format is a combination of XML architecture and ZIP compression for size reduction. So, in other words, it is an archive that contains separate xml files with different data that you can. NOTE! For the present File2Cart supports import of the first sheet of your xls (xlsx) document only. .TXT is a file format that shouldn’t be strictly formatted. Its structure is usually series of plain text lines. TXT file is very simple and it can be opened by every editor that supports text recognition. It is universal, consequently it is good for data storage. Import all necessary entities (including products, categories and so on) to your store with File2Cart. TXT import to more than 30 shopping carts (Magento, PrestaShop, Virtumart and many more) becomes much faster and easier.